Premise: Archaeology professor by trade and treasure hunter by passion, Indiana Jones (Harrison Ford) is recruited by the American government to track down the Ark of the Covenant before Hitler and the Nazi party can find it and unlock its unearthly powers. Teaming up with his ex, Marion Ravenwood (Karen Allen), Indy faces angry natives, a ruthless plunderer, and lots of snakes on his intercontinental race to find the lost Ark before the Nazis can. Fun Fact: The scene in which Indy shoots the scimitar-waving swordsman was improvised. Jones was supposed to use his whip to disarm the attacker, leading to a lengthy fight, but Ford (along with most of the cast and crew) had food poisoning the day the scene was being filmed and he didn’t feel physically up to it. He decided to just shoot the swordsman, resulting in one of the biggest laughs of the movie. 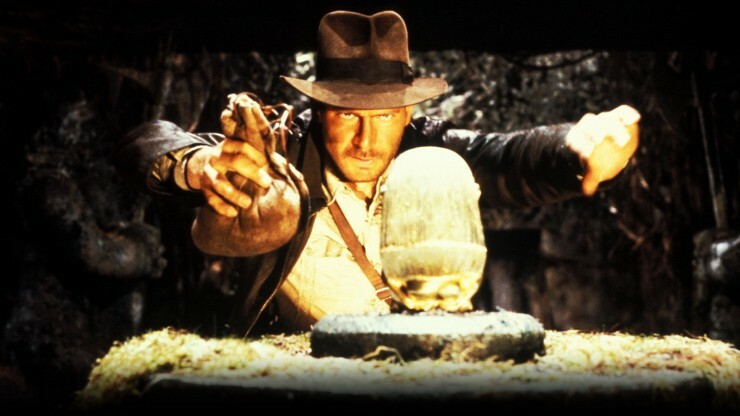 Verdict: Indiana Jones was anything but the typical hero when he debuted in 1981. While action heroes like James Bond and Superman never got beat up, were scared, or bungled things, Indy was the complete opposite: he was constantly getting bashed around and bloody, he was petrified of snakes, and one more than one occasion he survives death by all chance and no skill. An homage to the serial heroes of nickelodeon shorts, Spielberg (along with George Lucas) crafted a masterpiece in adventure, with every sequence being practically flawless and with not a single throwaway scene. (Seriously, the next time you watch it, try and find just one scene that hasn’t been parodied and quoted ad infinitum, or that you could remove without damaging the whole.) Raiders of the Last Ark starts off with an explosively tense opening number and never slows down until its unnerving final shot. A fantastic score, a perfect performance from Ford, and action sequences that are both skilfully executed and wonderfully grand coalesce into the greatest adventure movie ever made and the greatest movie Steven Spielberg has whipped up — so far.